The Dynaflex allows you to achieve the competitive edge no matter what instrument you play. 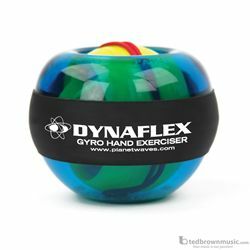 This handheld gyroscope builds and conditions hands, wrist and forearms while also increasing hand speed and endurance. It's like having a personal musicians gym in the palm of your hand. Simply start the rotation and then with a rocking motion, build up the gyroscopic speed and feel the burn. Great for keeping the playing muscles toned when away from your instrument or for pre-show warm up. Use in conjunction with the Planet Waves Vari-Grip for the complete finger, hands, and arm workout.